Delivery times range from 45 minutes up to a 1 ½ hours depending on how busy we are. When phoning your order in, you will be given an approximate time for delivery. Our delivery people are fully insured and work hard to make sure your order is delivered as quickly as possible. We can accommodate over 30 diners in our dining room. If you have a party of over six, call a few hours or twenty-four hours ahead of time to inure we have seating reserved and ready for you. We accept Cash as well as Discover, Master Card and Visa cards. Appreciate your business as well as following our Facebook page!! We are a locally family owned and operated restaurant known for great pizza, Italian & American cuisine. We welcome you to dine in or have it delivered!! Please save your yellow coupons provided with your pick up or delivery pizza. You can redeem 14 coupons for a FREE 12” medium cheese pizza or 20 coupons for a FREE 14” large cheese pizza. Mention the coupons to redeem them when ordering. 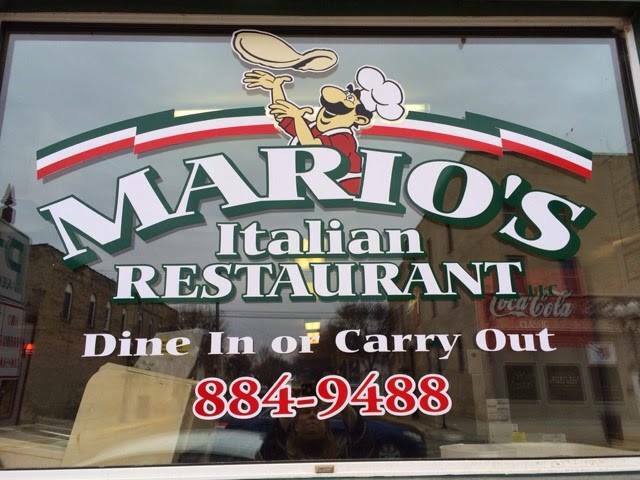 Mario’s Pizza is a local employer and currently has a staff of thirteen employees of all ages. If you are interested in working with Mario’s Pizza, please stop in and fill out an application. Jim & Ardith Oldenburg purchased Mario’s Pizza from the founders in Edgerton Wisconsin in 1986. They worked hard to build a great business that has become known for great homemade food, friendly staff and helping their community. Jim & Ardith raised five children as well as becoming surrogate parents and friends to many employees over the years. When the time came for Jim & Ardith to retire, their daughter, Carla Zimmerman, took the family business over. Carla takes great pride in carrying on her family’s tradition of preparing, serving and delivering great food for you to enjoy as well as providing friendly service with a smile. Their homemade pizza dough, pizza & spaghetti sauce, lasagna, meat balls and Italian beef are all made from scratch using their proprietary recipes. A lot of our meat products are sourced locally from Sorg’s Meats in Darien. Mario’s Pizza ONLY uses 100% Wisconsin cheese. Vegetables, onions and other toppings are purchased fresh and chopped/sliced/prepared on site as needed. Pizza is cooked using slate ovens and has been for over thirty years.